» What will propel the growth of mining? Your comments on the mining industry in India? Over the last decade, the contribution of the Indian mining sector to the country’s GDP has been stagnant at nearly 1.2 per cent. 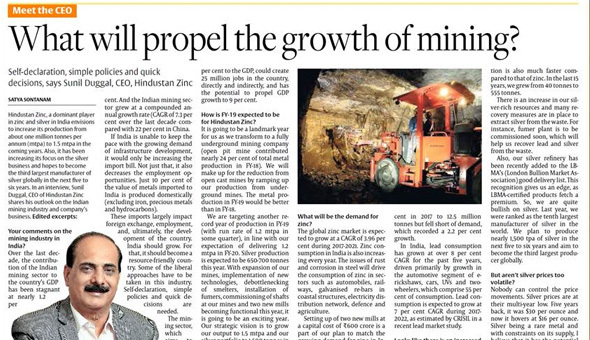 And the Indian mining sector grew at a compounded annual growth rate (CAGR of 7.3 per cent over the last decade compared with 22 per cent in China. If India is unable to keep the pace with the growing demand of infrastructure development, it would only be increasing the import bill. Not just that, it also decreases the employment opportunities. 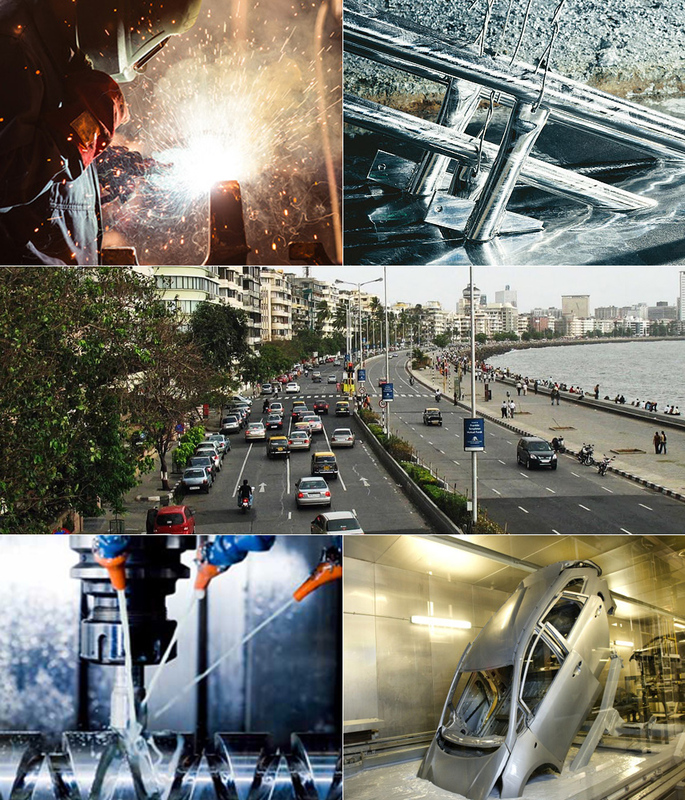 Just 10 per cent of the value of metals imported to India is produced domestically (excluding iron, precious metals and hydrocarbons). These imports largely impact foreign exchange, employment, and, ultimately, the development of the country. India should grow. For that, it should become a resource-friendly country. Some of the liberal approaches have to be taken in this industry. Self-declaration, simple policies and quick decisions are needed. The mining sector, which aims to contribute 7-8 per cent to the GDP, could create 25 million jobs in the country, directly and indirectly, and has the potential to propel GDP growth to 9 per cent. How is FY-19 expected to be for Hindustan Zinc? It is going to be a landmark year for us as we transform to a fully underground mining company (open pit mine contributed nearly 24 per cent of total metal production in FY-18). We will make up for the reduction from open cast mines by ramping up our production from underground mines. The metal production in FY-19 would be better than in FY-18. We are targeting another record year of production in FY-19 (with run rate of 1.2 mtpa in some quarter), in line with our expectation of delivering 1.2 mtpa in FY-20. Silver production is expected to be in the range of 650 to 700 tonnes this year. With expansion of our mines, implementation of new technologies, debottlenecking of smelters, installation of fumers, commissioning of shafts at our mines and two new mills becoming functional this year, it is going to be an exciting year. Our strategic vision is to grow our output to 1.5 mtpa and our silver portfolio to 1,500 tonnes in the next few years. What do you foresee the demand for zinc? The global zinc market is expected to grow at a CAGR of 3.96 per cent during 2017-2021. Zinc consumption in India is also increasing every year. The issues of rust and corrosion in steel will drive the consumption of zinc in sectors such as automobiles, railways, galvanised re-bars in coastal structures, electricity distribution network, defence and agriculture. Setting up of two new mills at a capital cost of ₹600 crore is a part of our plan to match the growing demand for zinc in India. With three million-plus tonnes of additional treatment of ore, we would be able to increase the volume of the metal substantially. What is your outlook for lead? Lead, zinc’s sister metal, was in deficit in 2017, driven by shortage in mine supply. Globally, refined production grew at 1.1 per cent in 2017 to 12.5 million tonnes but fell short of demand, which recorded a 2.2 per cent growth. In India, lead consumption has grown at over 8 per cent CAGR for the past five years, driven primarily by growth in the automotive segment of e-rickshaws, cars, UVs and two-wheelers, which comprise 55 per cent of consumption. Lead consumption is expected to grow at 7 per cent CAGR during 2017-2022, as estimated by CRISIL in a recent lead market study. Silver is our top-up product (the company derived nearly 10 and 16.65 per cent of its revenue and operating profit respectively from the silver segment in FY-18). Margins on silver are close to 80-85 per cent and most of the revenue from it is contributing to our bottomline. The CAGR of our silver production is also much faster compared to that of zinc. In the last 15 years, we grew from 40 tonnes to 555 tonnes. There is an increase in our silver-rich resources and many recovery measures are in place to extract silver from the waste. For instance, fumer plant is to be commissioned soon, which will help us recover lead and silver from the waste. Also, our silver refinery has been recently added to the LBMA’s (London Bullion Market Association) good delivery list. This recognition gives us an edge, as LBMA-certified products fetch a premium. So, we are quite bullish on silver. Last year, we were ranked as the tenth largest manufacturer of silver in the world. We plan to produce nearly 1,500 tpa of silver in the next five to six years and aim to become the third largest producer globally. But aren’t silver prices too volatile? Nobody can control the price movements. Silver prices are at their multi-year low. Five years back, it was $30 per ounce and now it hovers at $16 per ounce. Silver being a rare metal and with constraints on its supply, I believe that it has the potential to bounce back to $30 per ounce. Is Hindustan Zinc exploring to separate its silver business? We are exploring various options in the interest of our stakeholders. Ultimately, it should benefit the overall business.